The Lewes Pound is a local currency in use in the town of Lewes, East Sussex. Inspired by the Totnes pound and BerkShare, the currency was introduced with the blessing of the town council in September 2008 by Transition Town Lewes - a community response to the challenges of climate change and peak oil. Lewes first introduced its own currency in 1789, but this was discontinued in 1895 along with a number of other local currencies. Its reintroduction in September 2008 achieved national media coverage. On 3 July 2009, it was announced that the scheme was to be extended. New notes of £5, £10 and £21 denominations would be issued. The value of the Lewes Pound is fixed at £1 Sterling, and as of January 2009 may be used in any of approximately 130 shops in Lewes (having increased from 70 when the currency was introduced). Despite its nominal value, some businesses charge a lesser fee in Lewes Pounds, and some of the earliest notes have been sold (for example) on eBay for substantially higher values. 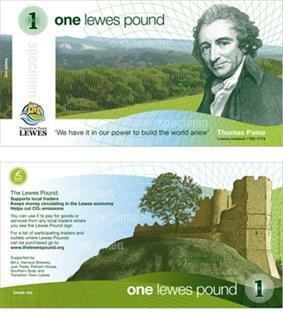 The front features a picture of the South Downs with an image of Lewes resident Thomas Paine and a quotation of his: "We have it in our power to build the world anew". On the back is a picture of Lewes Castle. The notes are printed on traditional banknote paper and have a number of security features including unique numbering, watermarks and heat marks. The Lewes Pound and the Transition Towns movement have received criticism for a failure to address the needs of the wider Lewes population, especially lower socio-economic groups. Such local currency initiatives have been more widely criticised in light of limited success in stimulating new spending in local economies and as an unrealistic strategy to reduce carbon emissions. ^ "Lewes Pound great value with 10% off". The Argus. 2008-09-09. ^ "New notes boost town's currency". BBC News Online. 2009-07-03. Retrieved 3 July 2009. ^ "Barter economy". BBC. 2009-01-24. ^ "Lewes banknotes are a tourist attraction, not a boost to the economy". The Times. 2009-09-21. ^ Bates, Stephen (2008-09-10). "Rebellious town of Tom Paine and bonfire revels prints own banknotes". London: The Guardian. Retrieved 2010-05-07. ^ "Printer rolling in bank notes". The Plymouth Herald. 2008-08-30.